I have been making my lentil soup recipe for years and years. Everyone seems to love it. As the chef, I also liked how easy it was to make and versatile. I would joke that if I had my act together and started dinner in the morning, I would make the soup in the slow cooker, if I was on a normal schedule it would cook on the stove top, and if I totally had run out of time – into the pressure cooker it would go. Note: This post contains affiliate links. This means that I make a commission if you purchase something when you click through one of my links – at no cost to you. See my Disclosure Policy here. Well, along comes the Instant Pot and you can see that it is a marriage made in heaven for my lentil soup recipe. Seriously, the Instant Pot is a slow cooker, a stove top replacement (via the sauté function) and a pressure cooker all rolled into one – so it doesn't matter when I make the soup – it can all happen in the Instant Pot. For purposes of this post, though, I will give you the instructions using the pressure cooking function. Adapt it as you will. What I love about this lentil soup recipe is that it is full of vegetables and protein and the kids love it. Honestly, you can use a variety of vegetables – anything in your fridge that may not make it too much longer is fair game for this soup. But I will tell you exactly what I usually put into it. Just for reference, I make this recipe in a 6 Quart Instant Pot IP-DUO60 and it pretty much fills the pot. You can easily half the recipe if you would like a lesser quantity. I start by measuring out 1 cup each of dry brown lentils and dry split green peas (yes, that is my secret ingredient – no one even knows that there are split green peas in the finished soup!). Pour these into the stainless steel inner pot of your Instant Pot and rinse/drain with several washes of water until the water is clear and not cloudy. Pour out the final wash of water so that all you have are the wet lentils and split peas in the Instant Pot. Next add 8 cups of chicken or vegetable broth. I never have the boxes of broth on hand but usually stock up on this type of bouillon instead. This way I always have some ready to go for whatever recipe I happen to be making. Finally, toss in the 1 tablespoon olive oil and bay leaves. I think the oil adds to the “mouth feel” of the finished lentil soup recipe. I add the cumin powder and the black pepper to the soup after it is finished cooking because I feel the flavors stay stronger that way. Once everything is in the Instant Pot close the lid and put the valve into the “sealing” or closed position. Press the “Soup” setting button and set the time to 20 minutes on High pressure, normal setting. When the time is up and the Instant Pot beeps, let the pressure drop naturally. 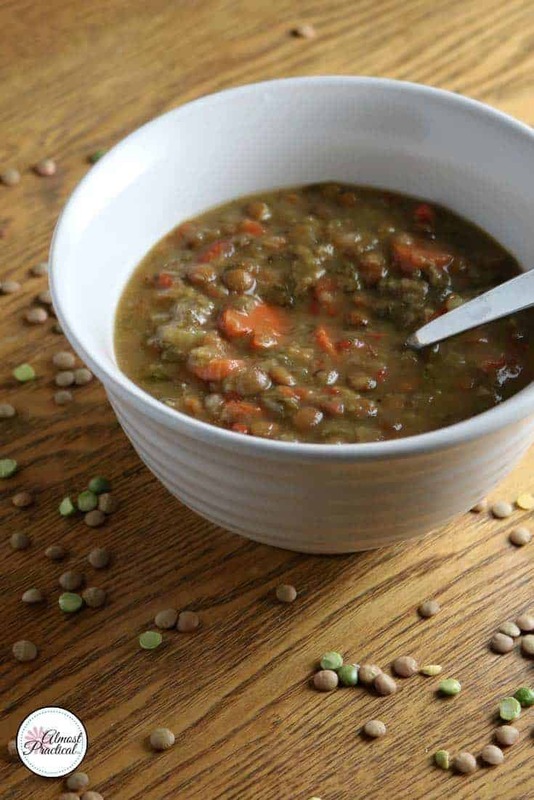 You can turn the “keep warm” setting off if you like – but it doesn't make a difference to this lentil soup recipe. After the pressure as dropped, unlock the lid and add in the cumin powder and black pepper. Taste the soup for salt and add more if you prefer. Serve as is, or over a bed of white rice. You can garnish this soup with some shredded pepper jack cheese or with a spoonful of homemade Instant Pot yogurt. 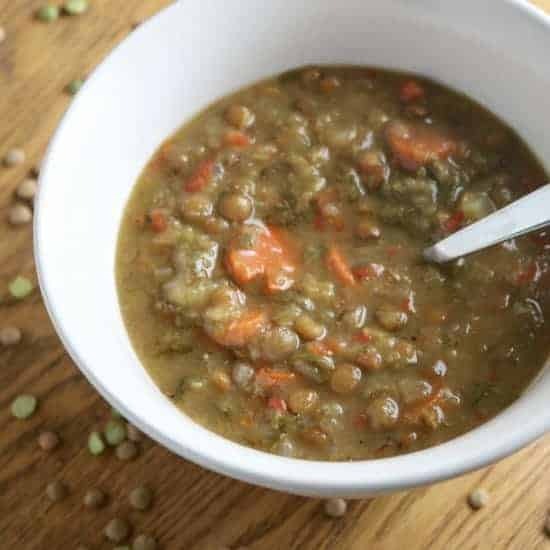 Pour the dry brown lentils and dry green split peas into the stainless steel inner pot of your Instant Pot and rinse/drain with several washes of water until the water is clear and not cloudy. Finally, toss in the 1 tablespoon olive oil and bay leaves. Once everything is in the Instant Pot close the lid and put the valve into the "sealing" or closed position. Press the "Soup" setting button and set the time to 20 minutes on High pressure, normal setting. When the time is up and the Instant Pot beeps, let the pressure drop naturally. You can turn the "keep warm" setting off if you like - but it doesn't make a difference for this lentil soup recipe. This sounds so healthy and yummy. Especially for the cold winter coming up. Thanks for sharing! I apologize for my late reply to your comment. I took a much needed blogging break to re-energize for the new year.